2012 Brammo Engage SMR. Picture credits - Brammo. Submit more pictures. The 2012 Engage Super Moto Racing was developed by the Brammo with the brief it must be �Ready to Win�. The very finest techno�logy and merciless power that�s just waiting to propel you to new victories. Price as new (MSRP): US$ 10555. Euro 9055. Prices depend on country, taxes, accessories, etc. Comments: Integrated Electric Transmission (IET). 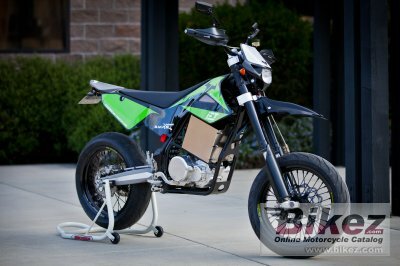 IET enables Brammo to offer its electric motorcycles with a 6 speed transmission. IET is a mechatronic propulsion unit that emulates the feeling and performance of a traditional internal combustion engine. Pre-order prices given. Ask questions Join the 12 Brammo Engage SMR discussion group or the general Brammo discussion group. Click here to sell a used 2012 Brammo Engage SMR or advertise any other MC for sale. You can list all available Brammo Engage SMR bikes and also sign up for e-mail notification when such motorcycles are advertised in the future. Ads with or without pictures are easy to create. Our classifieds are completely free with sections for every country in the world. You can also check out our list of related motorbikes. Compare technical data. Look at photos. View your fellow riders' rating of the bike's reliability, design, engine performance, accident risk, repair cost, etc.